We’d like to introduce you to Priyank, an MBA applicant, risk management consultant in NYC, and author of the blog Writing in Transit. Thank you Priyank for sharing your admissions experience with us, and best of luck to you! Accepted: First, we’d like to get to know you. Where are you from? Where and what did you study as an undergrad? What is your current job and where do you live? Priyank: Hi, my name is Priyank. I am originally from India but I completed both high school and undergrad in Florida (University of Florida – Go Gators!). Since undergrad I have been working in the consulting industry, first as a business analyst in technology consulting, and now as a risk management consultant. I recently moved to New York after travelling to the city for work every week for about two years. 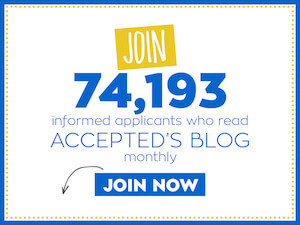 Accepted: Can you tell us about your blog? Why did you start blogging? What do you hope to gain from the experience? Priyank: I used to blog about trading and investing during my undergraduate years. But when I started working I was short on time and long on trading restrictions imposed by my clients. So I stopped that blog, but I have always enjoyed writing and knew I always wanted to start another one. When I seriously started considering an MBA, I started following some of the blogs by other students and applicants and was inspired to start one about my own MBA application experience. My blog is fairly new and is still taking on a defined personality, but right now most of my posts focus on my MBA journey. 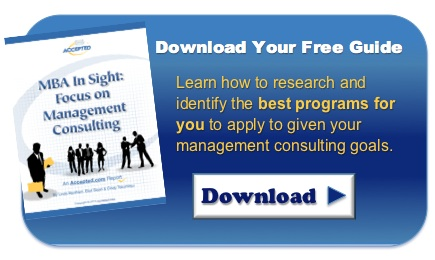 I have also written about some of my consulting experiences. Unlike swimming, writing is not a skill that stays with you forever. I hope that writing consistently for a few months leading up to my applications will help me refine my skill. I have also become a more reflective person as writing forces one to organize thoughts and put things in perspective. Finally, as I said, I enjoy writing – I find it to be relaxing and it is always good to see new visitors who [hopefully] enjoy my writing. Accepted: What stage of the application process are you up to? Priyank: Just finished the GMAT and now starting the essays. Accepted: What has been the most challenging aspect of the MBA admissions process so far? What have you done to approach and overcome that challenge? Priyank: I am still in the early stages of the application so I have not had too many challenges so far. Now that I am starting to look at essays, resumes, etc. I can tell that it will be hard to keep my creative juices flowing after putting in a full day’s work. I tried writing my first essay draft yesterday and after about half an hour all I got was “I sat”. But, as with anything worth doing, the application will require focused, undivided attention. This can be challenge while working, sometimes around the clock, and while balancing personal life. Accepted: Where do you plan on applying? Priyank: I was lucky to get a good GMAT score, so I have the top schools in my sight. I am looking for schools that have a strong focus in entrepreneurship and social enterprise. I would also love to stay in New York. Given that criteria, I will likely be applying to HBS, Stanford GSB, MIT Sloan, and perhaps Columbia and NYU. I am still doing research however, and Yale, Babson, Booth, and Wharton are all possible application recipients. Accepted: Do you plan on staying in the same industry post-MBA or switching to a new field? Priyank: It is possible I end up back in consulting, but I definitely want to switch my focus to non-profit / social enterprise consulting. I may also try to work in a start-up. I wrote a detailed post about this on my blog, and you can read all about it at http://writingintransit.wordpress.com/2013/05/23/why-get-an-mba-the-post-mba-plan/. Last updated on August 19, 2013.